Strong Towns is often accused of being “anti-car.” Why do you want to take away our cars? people ask. You’re just a bunch of hippies, pushing your pro-bike/walk agenda. Let me drive my car in peace. This isn’t Copenhagen. But the Strong Towns agenda—if you want to call it that loaded word (we prefer to call it a mission)—isn’t about biking or walking or cars. At its core, it’s about financial resilience, strength and antifragility. We envision a world where cities, towns and neighborhoods stand the test of time, providing prosperity for generations of citizens, and not spending themselves into unending debt-holes. It just so happens that cities and towns where biking and walking are safe options for residents tend to be more financially strong and resilient than towns built solely around the automobile. This is true for a myriad of reasons, which we thoroughly explore through our #SlowtheCars and #NoNewRoads campaigns. Today, we’re going to look at just one of the reasons why having transportation options besides cars makes good financial sense: On a personal scale, riding a bike can save you thousands of dollars while improving your health at the same time. And you don’t even have to give up your car to reap those benefits. Bikes are good for your wealth. Let’s start with the bare minimum: any mileage you put on your bike instead of your car saves you about 50 cents per mile in gas, depreciation, and wear and maintenance. From this savings alone, doing a couple of bike errands per day (4 miles) in place of car errands will add up to $10,752 over ten years. But the benefits are greater than that, of course. Once you get into bicycling, it may grow on you. You may be able to go without a car, or you might find, like me, that having an expensive car is no longer useful as a status symbol to you. This would allow you to keep a less expensive car (saving another $30,000+ over ten years). I couldn’t agree more. 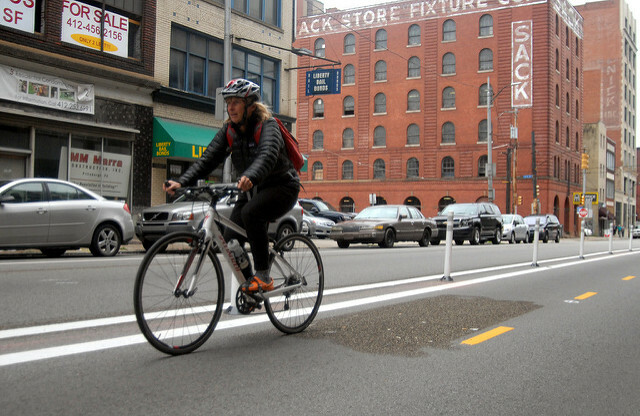 You don’t need to go carless or move to a hipster bike city like Portland (not throwing shade on Portland, just sayin'...) in order to save money through biking. By switching some of the trips (groceries, work, school, park, etc.) you would usually make in a car to the bike, you can still save thousands. By all means, take the car when it’s pouring rain or when you need to pick up four kids from basketball practice. But when it’s decent outside and you’re just making a routine trip to the drugstore that’s three miles away? Get that bike out. Your wallet and your body will thank you. I try hard to use this philosophy in my own life. I have use of a car most evenings and weekends (when my boyfriend’s not working) if I want it. However, more often than not, I opt to walk or take the bus to meet up with friends, run errands, go to the gym, etc. I know I’m saving money, getting exercise, and also avoiding the hassle of parking in an urban area. Even though the car is available, I make the conscious choice not to use it. It’s not because I’m a hippy or because I hate cars; it’s because I know I’m saving money. [Bikes] convert a slow human with a walking speed of 3.5MPH into one of the fastest creatures on land, with an easy cruise of 15MPH and a top speed of over 40MPH on level ground and 50+ downhill for athletic people. And the side effects are incredible... vigorous biking can consume 1000 calories per hour, meaning you can burn off an entire pound of fat in one big 3 hour ride. This kind of exertion pretty much fixes up all the rest of your body for free too, clearing your arteries, polishing your kidneys and teeth, and giving you clean stylish hair and a better sense of humor, all after the first ride. In 2007 when my son was old enough to start riding around with me, I bought a trailer like this one from the online bike store called Nashbar. This revolutionized my biking life, because suddenly my wife and I could get the little lad to most of the close parts of town with no car! When you leave the kid behind, these trailers can also carry a massive $150 load of groceries, or even a bunch of stuff from Home Depot like a few cans of paint and some light fixtures. The answer is, in 99% of these cases: WRONG! Amsterdam is chilly and rainy, and this is how the bike scene looks there. In Hamilton, Canada, I rode year-round to get to McMaster University, through a dense downtown area in snow up to a foot deep. It was awesome. In Asia, the streets are packed with 90-year-old-ladies zooming along on cruisers with panniers full of chickens and such […] JUST GET THE BIKE and you will see. "Just get the bike and you will see." Have you heard our podcast interview with Mr. Money Mustache? Check it out.